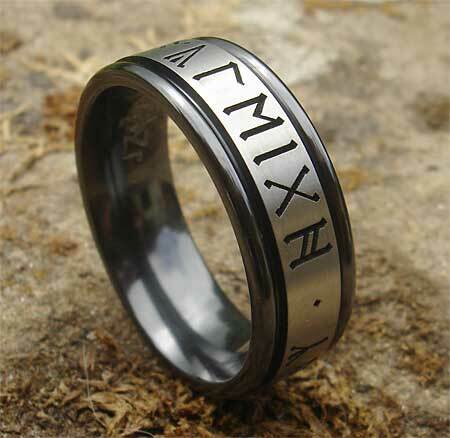 Personalised Rune Wedding Ring : LOVE2HAVE in the UK! This personalised Rune ring is the most unusual and very different from our other models featured in this section with its black edge rails, natural coloured centre and a black Rune Engraving around the outer central section. This striking ring features an attractive two-tone matte finish with a dark urban look in black and grey. The circular edge rails have been left black to give this ring even more of a two-tone contrast as the rails will catch the light. An impressive but simple engineers design trick. Zirconium is part of the Titanium family, but it has an incredible quality in that it changes colour if heated correctly using modern techniques. This method is how we achieve the two-tone zirconium rings on our site. The black coating is removed with specialist tooling to reveal the natural grey zirconium under its surface for the twin finish style produced as the ring has a natural coloured centre and black outer rails. The Rune Engraving is an ancient Celtic language. 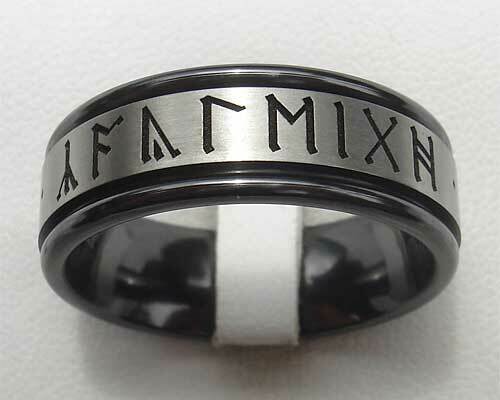 You may choose a Rune Engraving of your choice to appear on the outside of the ring. You can have anything you wish translated to Runic but please note that we can't do numerals. These rings make excellent personalised wedding rings. Please specify your choice of engraving in the comments box at check out. The personalised Rune engraving included in the price is FREE! Returns Policy: This UK made Rune ring is personalised and made to order so, therefore, non-returnable unless faulty or not as described. Please see our terms and conditions.